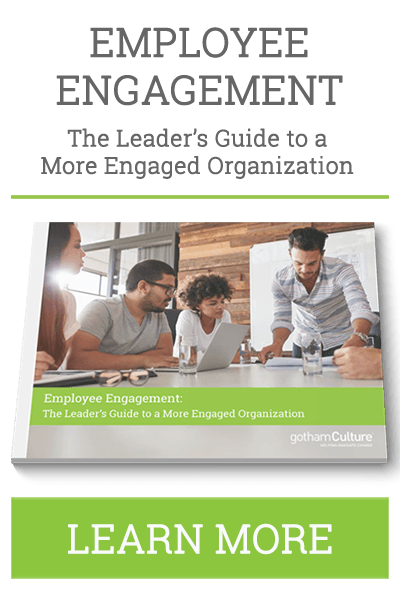 gothamCulture provides critical management consulting services to leaders who desire to use organizational culture as a key driver of performance. Our consultants provide targeted support at scale to meet your organization’s needs. How are we different than other consulting firms? We bring a relatable expertise to bear on our client engagements. Subject matter expertise without the ego is who we are. We’re not afraid to roll up our sleeves to get the job done. We live our values and we create meaningful and memorable processes that position our clients to achieve results. We have refined our culture assessment and change process with hundreds of clients over the last decade. We utilize only the most effective tools in our work, using empirically validated assessments that stand the test of time. We have over a decade of experience helping leaders improve organizational culture. We have formed long-standing relationships with many of the foremost thought leaders in this field and we have established a reputation for driving change with some of the world’s most recognizable brands. Significant and sustainable performance improvements are where the rubber meets the road. We have a track record of yielding such results; that’s why our clients engage us over the long-term. Our robust network of associates, located around the world, is highly skilled and experienced in a variety of specialties, ensuring our ability to support a wide range of client needs. Our ability to build custom project teams to support large-scale initiatives gives us a unique edge in the market. Our willingness to go the distance. We don’t leave our clients with a recommendations report to fend for themselves. We define our success by what happens after the recommendations are delivered. We support our clients’ change efforts to any extent necessary, ensuring they’re set up for success. Organizational culture change is our core business. We pride ourselves in making culture tangible for our clients so they can quantify and understand exactly how their workplace culture is impacting their performance and how it may need to change in order to achieve the results they’re looking for. We have developed a proven model for training internal change agents to sustain our clients’ culture change efforts. Once internal resources are able to drive the change, we can support our clients when needed to ensure results are achieved quickly and efficiently. To help our clients achieve exceptional organizational performance through the lens of culture, leadership, and strategy. To provide leaders with critical and thought-provoking insight that enables them to lead positive organizational change that drives improved performance. We feel a deep responsibility to each other and to our clients. We act with empathy and with the best interest of others in mind. We have an obligation to ourselves, our clients and other stakeholders to never settle for anything less than excellence. It’s the standard to which we hold ourselves and what others deserve from us. We remain humbly confident in our own capabilities and expertise. We pride ourselves on our ability to relate to our clients in an approachable, transparent manner. We are honest with each other and our clients. We do what’s right, even when no one is looking. We connect with each other in authentic ways because we know that together we can do more than any of us could alone. Each of us plays a unique part in fostering a community of involvement and inclusion. As our company has grown over the last twelve years, we have found ourselves in the honored position of working with an ever-increasing number people and organizations representing a variety of different cultures and backgrounds. At the same time, many of our clients are working to build awareness and understanding within their own employee populations to ensure more sensitive and productive interactions amongst their workforce. At gothamCulture, we are aware of our unique role and ability to address the concerns and needs of our clients to increase equity for all, and we have made a commitment to increase our understanding and awareness of equity, diversity and inclusion, and to expand our capacity, as facilitators, advisors, and consultants, in order to be keenly sensitive to understanding and learning about people with varying backgrounds. Given this, we realize there is always more we can do – at the individual and company level – to make sure that the work we are doing promotes equity, diversity, and inclusion. We hope that our commitments below will continue to lead to larger actions and deep learning that will help us – and our community of practitioners – continue to develop our capacity in this space. On a regular basis, we will review our presentation and facilitation materials to ensure content is culturally sensitive. We will address potential content and presentations so they do not reflect unconscious bias. We will continue to bring more deliberate conversations around equity, diversity, and inclusion into our coaching conversations with facilitators. As the people in the room charged with creating an environment of trust and learning, we see this as a capability that our facilitators need to embrace. We encourage our facilitators to give each other feedback – specific, observable, and impactful. We encourage an open and trusting environment amongst our own staff and contractors, with total honesty and total kindness, and reinforce our commitment to a culture of inclusivity. We recognize the impact that a facilitator’s insensitive comments or response to a participant’s culture can create resentment and distrust, and can affect the psychological safety throughout the room. It is imperative that our facilitators have the skills to work with people of all different cultures, identities, and lived experiences – this includes a level of radical self-awareness, on the part of our facilitators, of their own biases and privilege and how that may impact their facilitation. We will continue our efforts to diversify our staff and vendor relationships: We know that awareness and self-management is only one piece of the puzzle. 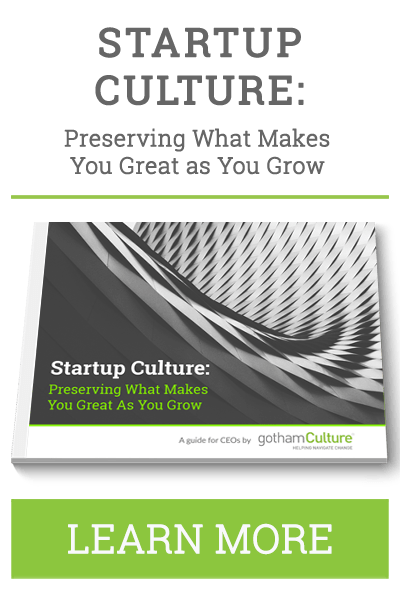 As gothamCulture grows, we are committed to hiring and working with a diverse pool of professionals. We continue to search for a broad bench of facilitators, and we regularly attend events to recruit greater diversity. We will also continue to host diversity fairs, bringing our team, our subcontractors, and our clients together. We will share our practices and learnings. We will ensure accountability through the request and collection of feedback from our clients, participants, and other stakeholders, and we will share and learn from those experiences. We believe that by sharing and learning with each other, we can strengthen our existing practice and commitments to better serve our employees and society as a whole. Through a regular Community of Practice, we will encourage open participation and dialogue amongst our facilitator community.